After visiting Highlander’s relatives in Canada, we always bring back foodstuffs so we can savor the flavors from our North American neighbors when we are back in the United States. Maple products are popular, like syrup, cookies and candies, following the iconic leaf on the nation’s flag. We got a can of Canadian maple syrup that we typically put on pancakes. It was a lot of syrup for just the two of us so we decided to try a recipe for ribs that featured a maple glaze. 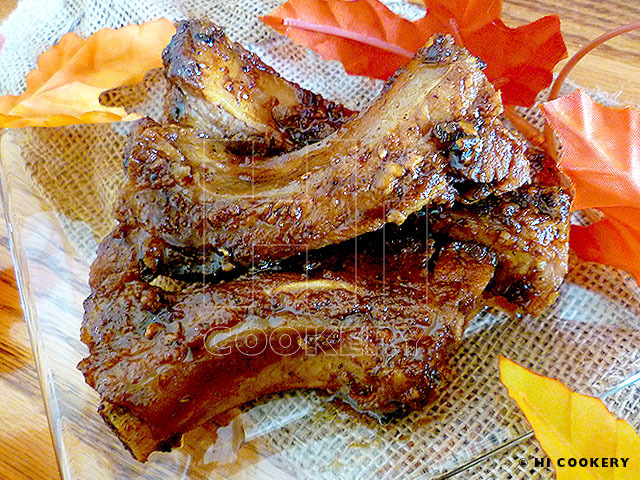 We are used to the southern-style BBQ ribs with its saucy marinades. 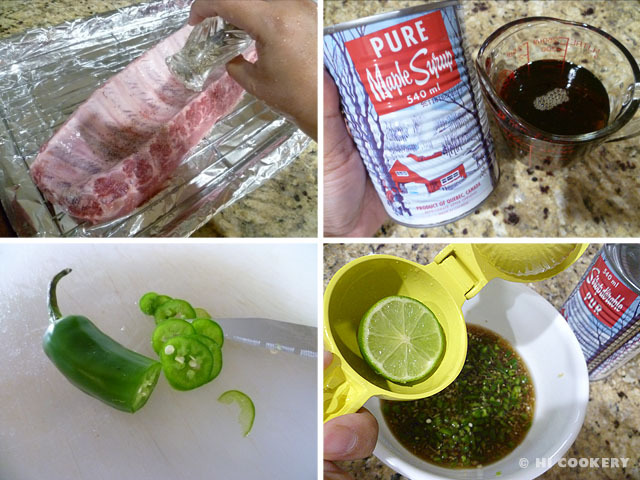 But maple-glazed ribs were a nice change and they are perfect for a picnic in the summer and, with a hint of jalapeno heat in this recipe, hearty and heart-warming to eat during the colder seasons when National Maple Syrup Day is scheduled. Line a lipped baking pan with foil to catch the drippings. Salt and pepper both sides of the ribs. Place meat side down. Make the maple glaze by mixing the maple syrup with garlic, ginger, japaleno and lime juice. Brush the top and sides of the ribs with 1/3 of the glaze mixture. 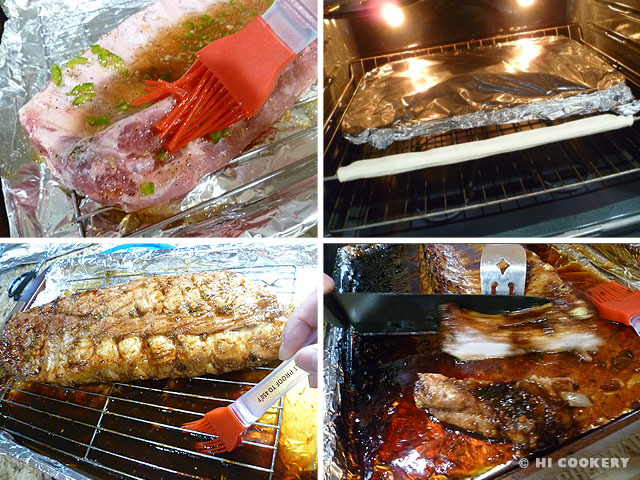 Cover the ribs with foil and bake in a preheated oven at 300 degrees F for 30 minutes. Remove from the oven, carefully lift the foil and avoid escaping steam, turn the ribs over and brush another 1/3 of the glaze mixture on the meat side of the ribs. Cover again with foil and return to the oven to bake for another 30 minutes. Remove the ribs from the oven and discard the top foil. Turn up the oven’s heat to 375 degrees F. Baste with the remaining glaze, return the ribs to the oven and cook for another 15 minutes. Remove from the oven again and continue to baste, spooning the darker drippings onto the ribs to give them some color. Bake for 15-20 more minutes. Remove from the oven, slice the ribs, put them on a platter and spoon some of the glaze drippings on the meat. Serve hot. There are some burnt bits of maple glaze drippings on the baking pan. Mix this caramelized gooey goodness with the thinner meat juices and brush on the ribs to give them some color. Serve these ribs for a summery Canada Day picnic on July 1. Try the recipe for maple-glazed chicken for National Maple Syrup Day. 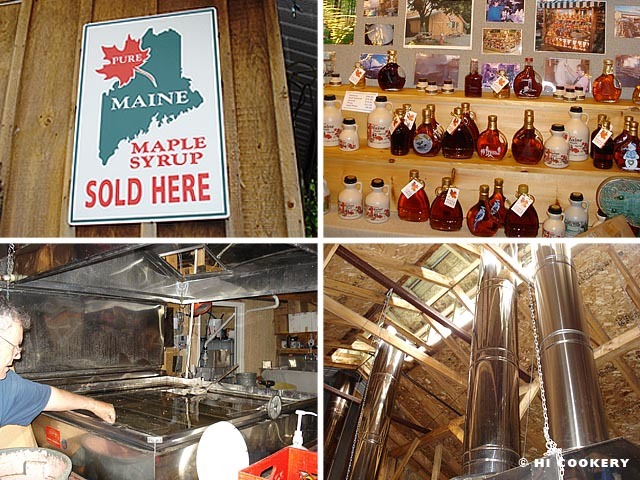 We bought a bottle of maple syrup from Bob’s Sugarhouse when we were in Maine visiting our goddaughter, Keira B., and her family a few summers ago. The rustic cabin had shelves lined with a variety of decorative glass containers, tins and plastic jugs filled with 100% Maine maple syrup and other fine maple and Maine products. The owner of the sugarhouse, Bob Moore, personally gave us a tour of the syrup-processing equipment behind the storefront. He explained that it takes 30-40 gallons of maple sap to make just one gallon of syrup. Water from the sap must be filtered, boiled and evaporated until the syrup reaches proper density and a rich amber color. The distinctive taste of maple is worth all the effort. For National Maple Syrup Day, we made maple-glazed chicken with thyme and sweet potato hash using the 100% Maine maple syrup medium grade A amber that we bought at Bob’s Sugarhouse. Salt and pepper the chicken. Marinate in olive oil and a half bunch of thyme for two hours in the refrigerator. In a roasting pan, mix the sweet potatoes, onions and the other half bunch of thyme. Salt and pepper to taste. 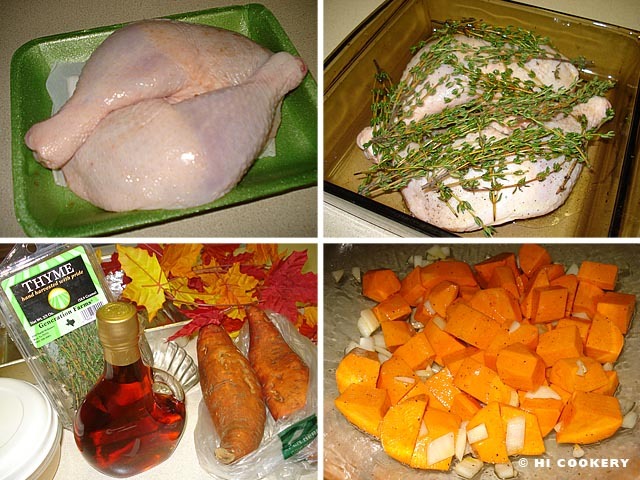 Place the chicken among the sweet potatoes and onions mixture, drizzling the rest of the olive oil marinade over the chicken and arranging the thyme on the top and sides. Pour the maple syrup over everything. Bake in a preheated oven at 375 degrees F for 45 minutes or until the chicken is cooked through and the top skin is browned. 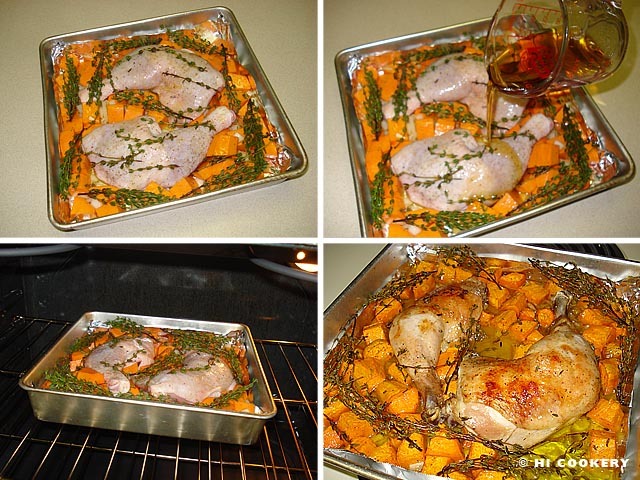 Drain oil and discard the baked thyme sprigs. 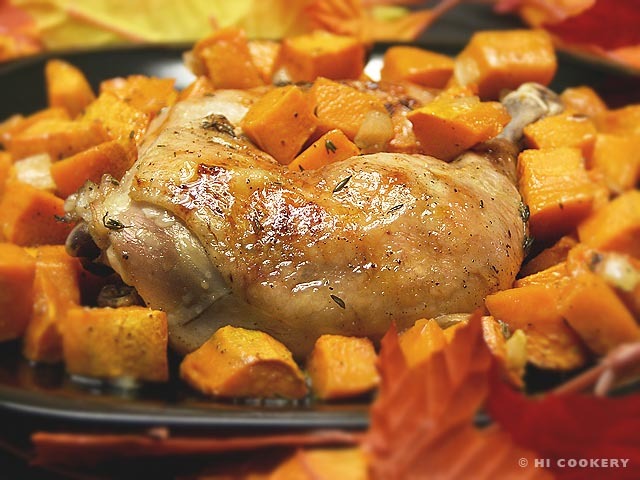 Serve the chicken with the side of sweet potatoes and onions and garnish with a fresh sprig of thyme. We reduced the recipe by a third to feed just the two of us (and save our pricey yet precious Maine maple syrup for another blog recipe). Read an interview with Chef Robin Paula, creator of the above recipe, on the Continental Airlines website. We first saw her recipe printed in the July 2010 issue of the inflight magazine when we were flying from Hawaii back to the mainland after a short summer vacation.